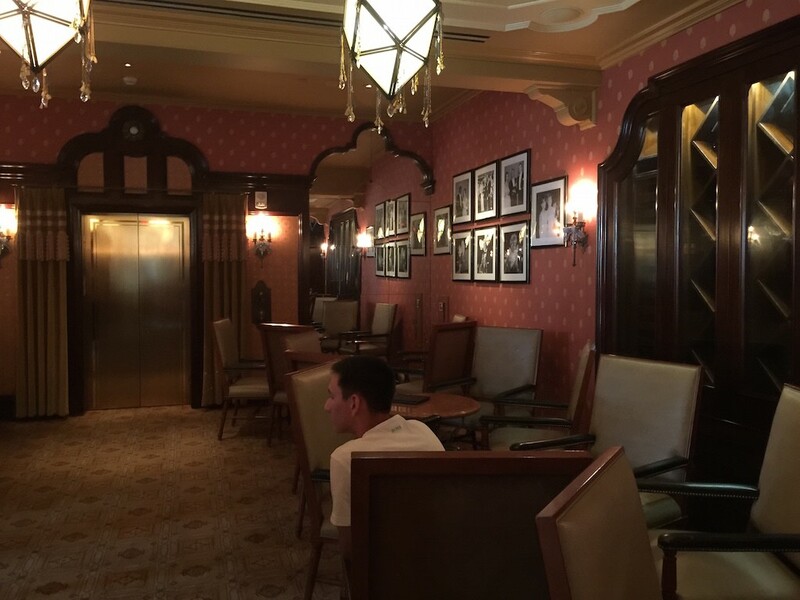 As part of our VIP tour to Disneyland for the 60th, we got a private tour of Carthay Circle Restaurant and the exclusive 1901 lounge (more on that in a future post). 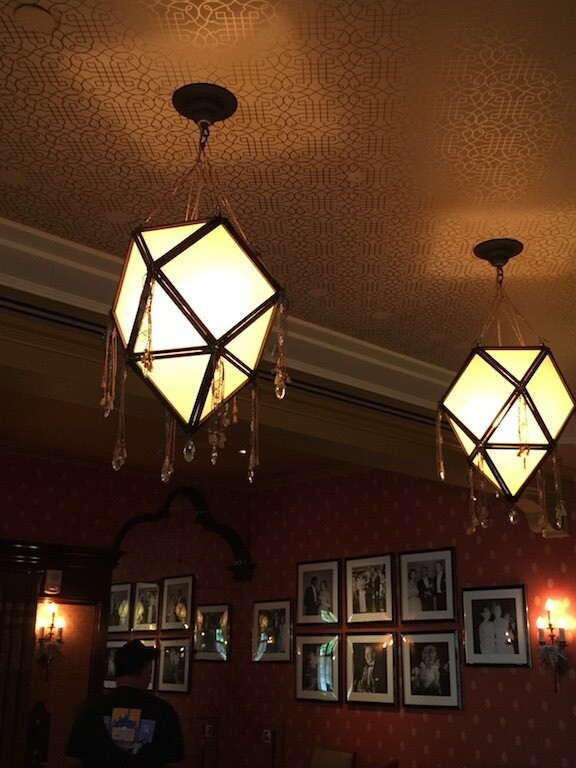 This was the first time I’d been inside the Carthay Circle Restaurant. 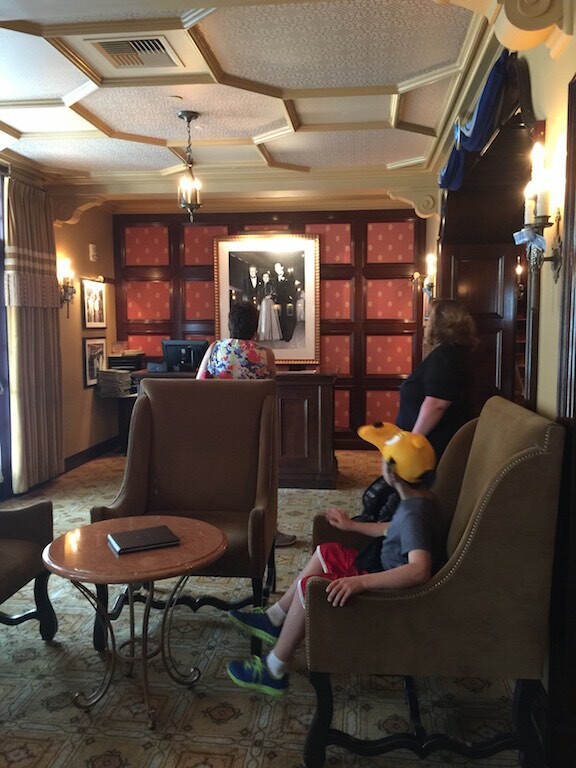 Typically we don’t do sit down dining while at Disney – it’s too expensive and we are happy with the counter service. 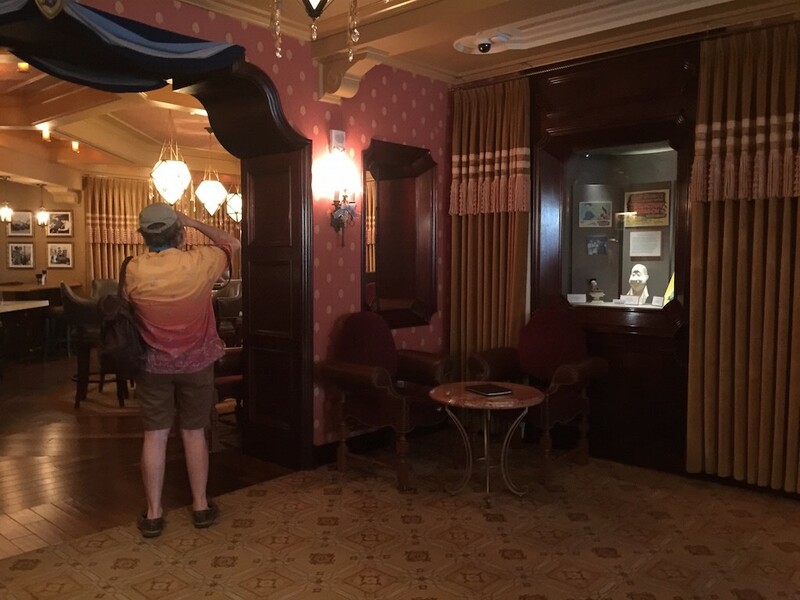 Anyway onto the restaurant, as Disney California Adventure is Hollywood themed at the turn of the century through 1920s, this theme follows into the restaurant itself. Quietly understated elegance, lots of dark woods and black and white Hollywood photos from this era. 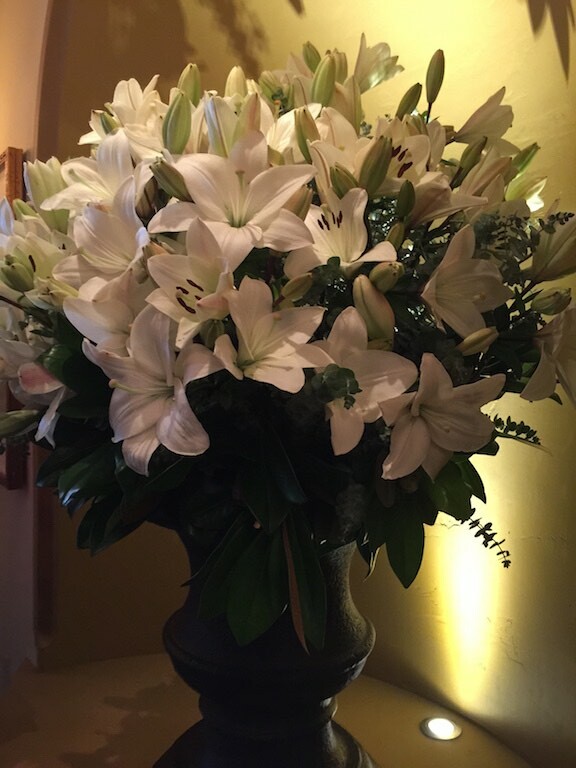 As you enter, the first thing that you see is an enormous bunch of lilies – these were huge and more surprisingly, real! A tribute to Walt Disney’s wife Lilian. Downstairs, is a very comfortable lounge area, where you can sip a cocktail while waiting your dining reservation. 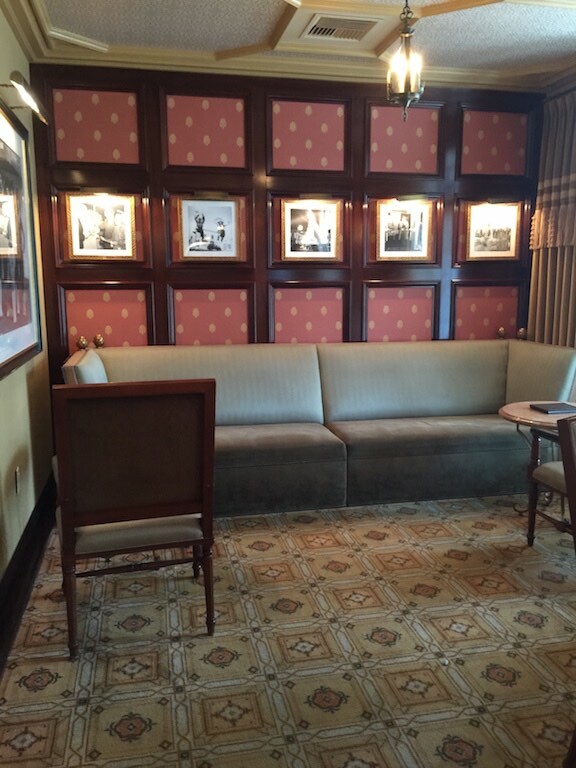 The carpeting and wallpapers are period recreations of those used in the era. Upstairs is the main dining area, it’s a lighter space and there are side rooms off the main dining area for groups and to stop the noise carrying too far. Again the lilies and the same theme, albeit, brighter. One thing of note in the centre tables in the dining room is the wood grain. 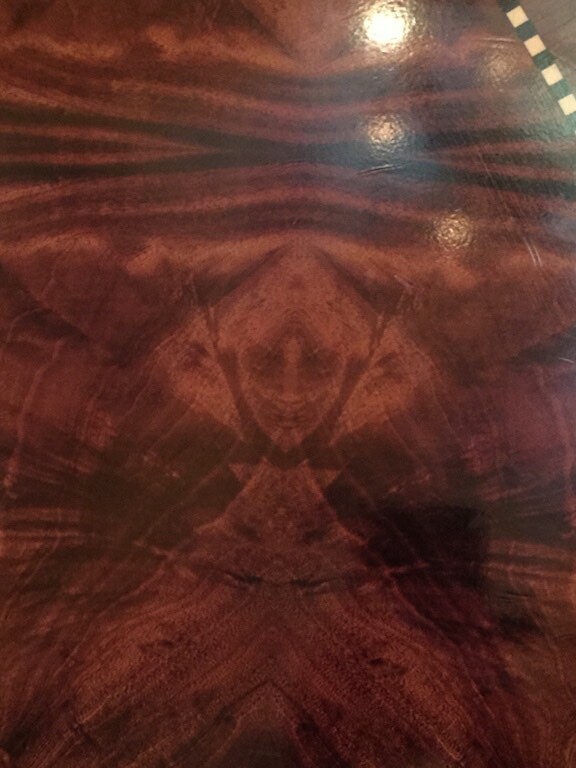 Do you see the figure? 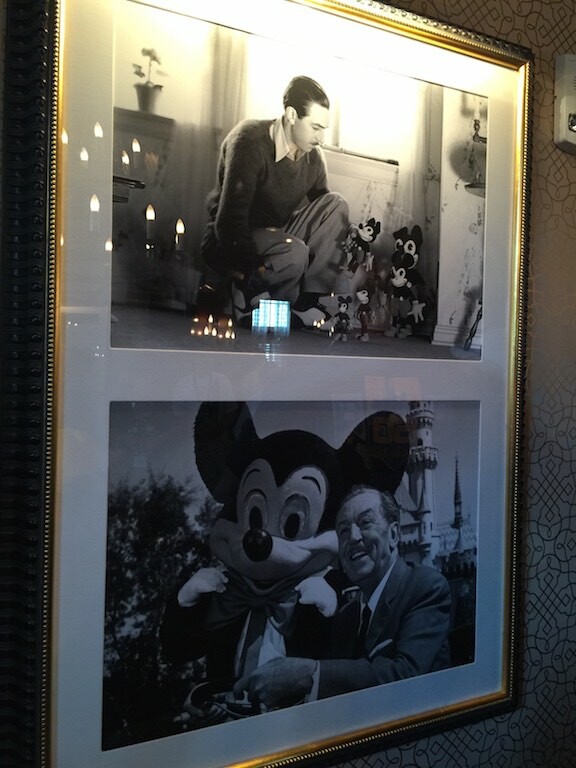 These photos shows the very first and last photographs of Walt Disney with Mickey Mouse. 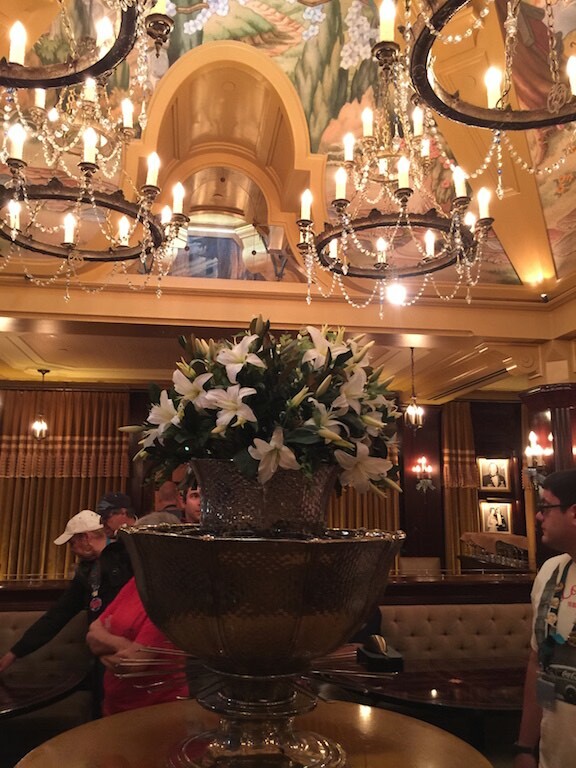 Following our guided tour to Carthay Circle we headed out to do whatever VIP tour tourists do until lunch time. Then back for our much-anticipated lunch! As Mickey Mouse would say “Oh boy!”. They had given our group one of the side rooms to ourselves. We were presented with a menu from which to choose. Hmmm… vegetarian options? The server managed to provide a loaf of bread in place of the house specialty biscuits – which contained bacon. A plain loaf with butter. I’m not much of a fan of bread and this was nothing to get excited over. For our entree (or as we call it here in New Zealand, our main), we were asked if we would like pasta or a veggie tower. The pasta had a choice of alfredo, tomato or plain. We said alfredo with any vegetables they cared to include – we aren’t fussy, we just would rather not eat what was once a sentient being. No photo of the meal, but the pasta was nothing to get excited about, nor was the salad we had prior to it. The pasta was fairly bland, the alfredo sauce lacked any flavour and I’d have had to get a magnifying glass out to find any vegetables in it. Carb overload! So I had high hopes for dessert. Looks pretty right? 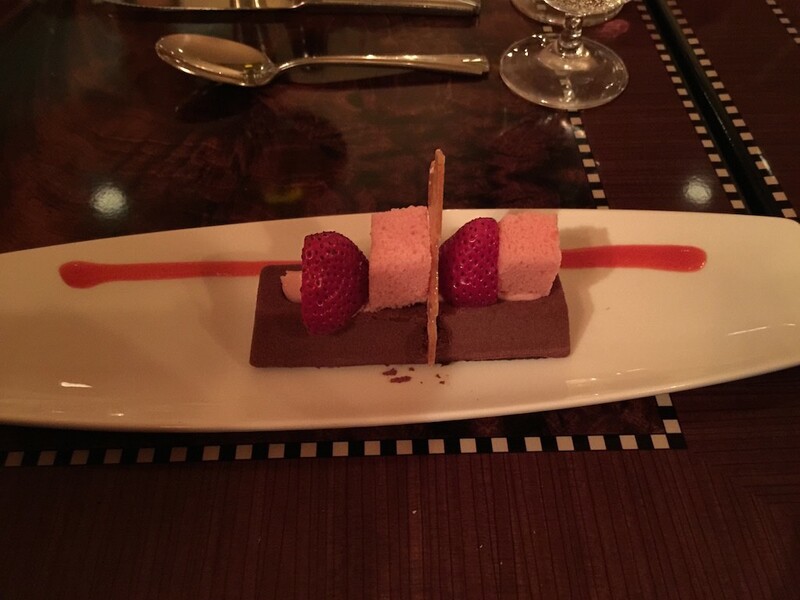 The chocolate mousse part was good. The strawberry croutons? Well I’m pretty sure this was the leftover cake from Disneyland’s opening day 60th years ago. Time capsule cake perhaps? 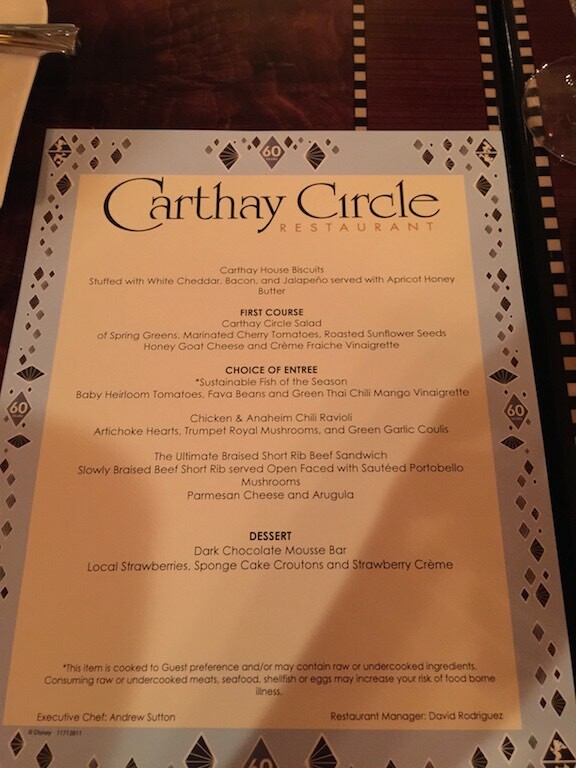 An incredibly disappointing meal at Carthay Circle, this was the worst meal of the trip, other than the food on the flight on the way back home from LAX. I wasn’t the only one to think so either, others in the group were disappointed with their meals too. Disney can do way better than this! I had a meal in Mexico at EPCOT, I remember being underwelmed by the food but really liked the setting.